Bodybuilder Stacie Venagro has abs of steel. That's already super-impressive—and more so when you consider she's pregnant. No wonder she's reading Fit Pregnancy! Stacie Venagro is here to give the "six pack mom" herself, Sarah Stage, a bit of competition. The super-fit bodybuilder is pregnant and she has the baby bump to prove it—but she also has her enviable chiseled abs which, despite the bump's affect, are still totally intact. Venagro is 31 years old and 30 weeks pregnant, according to PEOPLE. She's also a three-time World Miss Fitness America Pro and the winner of of Miss Fitness Universe. 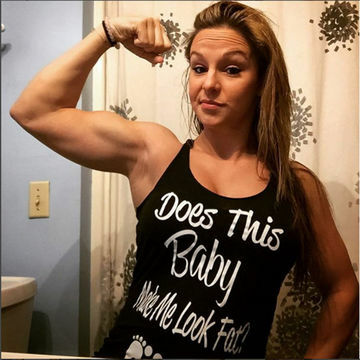 Her Instagram account is chock full of photos showcasing her growing baby bump—which has been impressively muscled throughout the duration of her pregnancy. The comparisons to Stage are inevitable—but unlike the other incredibly fit mom, Venagro says she hasn't faced much backlash. "No, [I haven't,] and I have to say, I'm shocked," Venagro tells Mom.me. "My friend and people in the fitness world have been extremely supportive. They know that I'm embracing this pregnancy, I'm embracing my body's changes." Venagro's husband worries a bit about her frame—but she assures everyone that she's doing her part to stay healthy. "My husband thinks I need to eat more. And I can, and I do, but I do it in moderation," she says. Venagro doesn't subscribe to the belief that pregnant women should "eat for two." Instead, she's added an extra 200 calories a day to her diet. "I take in either a bigger breakfast or lunch and a smaller dinner," she says. "I'll have an Isagenix shake, adding blueberries, chia and flax seeds, frozen berries, ice, water, coconut oil and powdered peanut butter. That takes it from 270 calories to more than 400 calories." She also details what she eats throughout the day. "My next meal is something like egg whites, Ezekiel toast and spinach. Lunch today was a cup of pasta e fagioli, chicken with green beans and roasted potatoes, all in a sensible portion, and mousse cake for desert. At night, I'll have a shake or a bar," she says. Venagro indulges, too. "Even though my doctor told me I only need 200 extra calories a day ... I do have sweets. I have chocolate. It's all in moderation. I'm taking in healthy and unhealthy calories, in a moderate way," she confesses. Venagro has kept up with her workouts throughout her pregnancy—but she's not increasing the weight she lifts or doing work on her back. "Listening to the doctors and making sure you are on track is all you need," Venagro says. "Don't let someone else's negativity ruin your day or even stress you out during your own pregnancy."